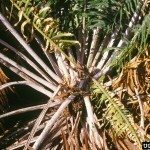 One of my sago palms (all five of them planted in ground) has fronds lighter green than the rest of the palms, almost yellow green. I feed it with a palm food. It has a 'pup' on one side and the plant shows no signs of dying. I have been growing the sagos from 'pup's for several years. The soil may have to much phosphorus, which is preventing it from taking up enough iron, which causes the yellow leaves. I would test the soil and fix the nutrient balance based on what the test suggests.